This week's EtsyInspired shop is Cose Dolci. This shop specializes in wool items. Mostly, they carry bowls, pillows, and plush toys. What I find truly amazing about this store is the things they can make from wool! Bowls? Really? My mind is completely blown. Everything is so beautiful! If you look in the sold items area of the shop, you will see a wide selection of items. I was especially impressed by the darling plush toys and the nested bowls. I think it's amazing how you can use this medium in so many different ways. 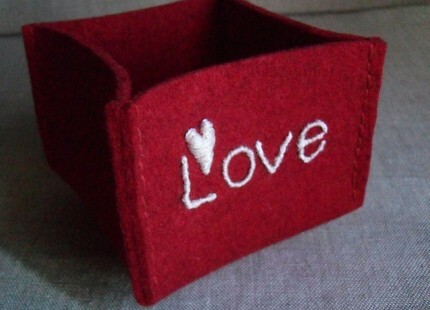 Before Etsy, I just thought wool was for socks and sweaters. This week's sponsor is one of the design teams I'm on. CAFFINATED CROPPER! YAY! I love when I can combine my teams! Amy puts together the most amazing kits you've ever seen! She puts in super creative items that I would not have ever thought about using on a card, but they turn out amazing. She also has a great eye for color. I thoroughly enjoy working with my kits from her and you will too! One lucky winner with get a mini version of this month's kit "With a Cherry on Top." 1. Go to the Cose Dolci store and pick any item to be inspired by (subject matter, colors, layout, anything.) Make a creation. 2. Post a link to your creation on the EtsyInspired #84 post on the EtsyInspired blog by next Friday April 23, noon Pacific time. A winner will be chosen from the people who enter. 3. If you upload to SCS or PCP, please you keyword EIC84. You may enter as many times as you like. Also, the Caffinated Cropper DT is playing along this week too. Check them out! I love this! That kit is so awesome! I hope you guys had a nice anniversary! Happy Anniversary! This is one amazing card. Happy Anniversary!! Love this card! Thanks for letting us be your sponsor this week!! WOW--this is a FAB kit! I now want the WHOLE thing:) Great card--super sweet! Happy Anniversary! Soooooo cute!! love the embossing!! Beautiful Ashley! Happy Anniversary! Hope you are having a great weekend! This is super cute Ashley! I love how you did the sentiment with those alpha stickers, totally cute! What a perfectly sweet anniversary card! 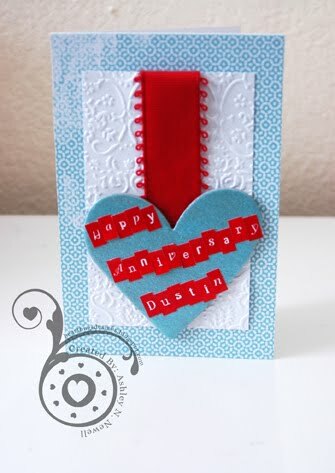 Hope you had a wonderful anniversary and I am sure Dustin will love his card!